Bennet Gartside and Akane Takada in The Dream. ©ROH, 2017. Photographed by Tristram Kenton. Artists of The Royal Ballet in Symphonic Variations. ©ROH, 2017. Photographed by Tristram Kenton. Zenaida Yanowsky and Roberto Bolle in Marguerite and Armand ©ROH, 2017. Photographed by Tristram Kenton. What did you think of The Dream / Symphonic Variations / Marguerite and Armand? Share your thoughts via the comments below. The Dream / Symphonic Variations / Marguerite and Armand runs until 10 June 2017. Tickets are sold out, but returns may become available. Further tickets are released for every performance on the preceding Friday in Friday Rush. The mixed programme will be broadcast live to cinemas around the world on 7 June 2017. Find your nearest screening and sign up to our mailing list. On 7 June 2017 the performance will be broadcast live and for free to outdoor big screens across the UK. Find your nearest screening. Last Saturday matinee...wonderfully put together programme, all stunning but The Dream was the best I've ever seen. David Yudes amazing, Francesca and Marcelino perfection. As was Itziar. I was at the rehearsal on Friday - so delighted to see The Dream back again. Loved Alexander Campbell and Laura Morera. Great treat to see Alessandra Ferri in M &A. Even from midway back in the amphi we could see every emotion played out beautifully. What a fantastic dancer. Looking forward, with very mixed feelings, to Zenaida' s performance tomorrow. Cant believe my favourite RB dancer is stepping down! Went to June 5th performance. The Dream with Laura M and Alexander C enchanting and beautifully performed - lovely definitive choreography from Ashton. Luca Acri superb as Puck. Symphonic Variations stellar. M&A with Natalia Osipova and Vladimir S pure delight. Saw the Saturday matinee and loved all the performances! Frankie and Marcelino were beautiful in The Dream and Reece handled the costume issue in Symphonic Variation (my fave purity ballet) really well and then continued to give us a great performance. My hilight though was Alessandra and Federico in M&A. Just stunning. Hope the two of them get to reprise these roles together when M&A comes back next year. Looking forward to tonight's live screening. "...Alessandra Ferri, throughout her career, was fascinating even when standing still..."
That long moment when she sees Armand from across the room and stands motionless. I've never known anyone be so charged, convey so much emotion, through stillness. Just been to live cinema relay - what a dream of an evening - three perfect ballets, danced with such exquisite perfection. Was really looking forward to tonight's live stream as it featured 2 of my favourite Ashton ballets. In The Dream I was really happy with the overall performance in particular Steven McRae and Valentino Zucchetti stood out. Akane danced well - but can someone please tell me what's going on with her left pointe shoe? It was the same at her first show, it looks like the side seam was torn, and I found it really distracting. Not a pretty sight. For me the highlight of the night was Symphonic Variations - the whole cast were perfect. Utterly beautiful - including the pointe shoes.It was great to see Roberto Bolle back, I just wish it'd been in another ballet. M & A will never be a favourite of mine and I would of loved to see Zenaida in Symphonic Dances, but in saying that being the artist she is she can make everything magic. A great ballerina who will be missed. 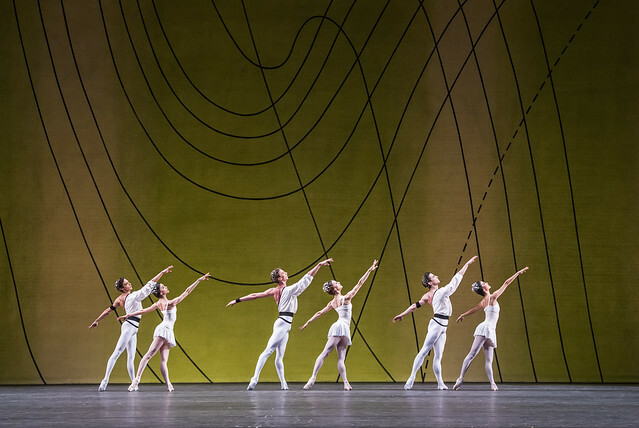 Last night a sumptuous pou pouri of enthralling wonderment and enlightenment greeted us, and left us in no doubt that The Royal Ballet shines out like a shaft of gold when all around is dark. And what gold we held – gold dust and fairy dust scattered all around us as we were presented with fleeting ethereal moments of spiritual marvel that reached in to the very core of our beings and touched our hearts and our souls with emotional spectacles of virtuoso bravura, grace, beauty, courage, delight, and wakefulness from one of the masters of choreography – delivered by the finest artists in the world. Tom Hanks – as Forest Gump – once said “Life is like a box of chocolates – you never know what you are going to get.” – and so it was with the opening of ‘Dream’ as straightway the ‘rustics’ launched into an amazing spectacle of virtuoso dancing - instantly showing off the precision, strength and harmony of the corps de ballet. Then we had the plot – revenge is sought after a lovers tiff and Puck bringing about total confusion as the mischievous Puck unintentionally messes up the magic and things go awry – with Bottom wishing to tell Titania how much he loves her – but is unable to do so because he has been turned into a donkey; and Demetrius tells the wrong woman how much he loves her – until all is happily resolved – and we are given Shakespeare’s sub-text to take away with us – ‘life is nothing but a dream so live your life to the full’. In all of Shakespeare's plays we see two recurring themes: the church and the monarchy do not possess 'magic powers'; and you cannot ever get rid of despotic leaders because the moment that you do so – a one far worse will take its place. To quote the Bard: 'Tis better to have the devil you know than the devil you don't' - and ‘The Dream’ proved the rule. 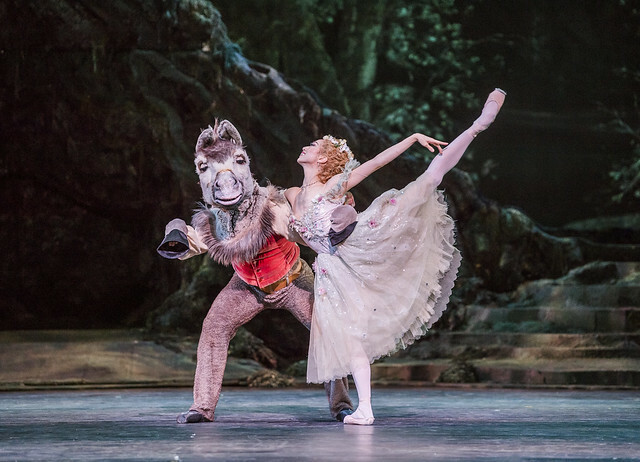 As to the incredible dancing – the surefooted mischievous Puck; the majestic pompous Oberon; and his brooding soulful Titania were a joy to behold – and as to Bottom – Bennet Gartside delivered the finest performance of the donkey that you are ever likely to see – capturing Bottom’s loneliness; his amazement; his fleeting joy; his frustration; and his disappointment with beautiful deeply moving pathos as we watch and laugh at Bottom’s comical antics spelling out his solitude and sadness - AMAZING! Well a wonderful narrative ballet performed in the classical style would be more than enough for one evening – but NO – the evening didn’t stop there for we then had the amazingly clever ‘Symphonic Variations’ – all variations playing with and playing around the number SIX – six principal dancers (pas de six); the number ‘six’ being displayed in plain sight six times; six solos; six ‘entrechats six’ (the ballerinos leaping into the air and beating their feet together six times – give it a go); six pirouettes; six jetes (leaps); six ‘variations’ – from six solos through three ‘pas de deux’ (3 X 2 = 6); two ‘pas de trois’ (dance for three – aka ‘entanglements’ where 2 X 3 = 6) to the ever-present pas de six; and the masterpiece lasting exactly thirty six minutes (six times six). And if a very funny, deeply moving narrative ballet followed by a ballet filled mirrors, mathematics, majesty, marvels, juxtaposition, and virtuosity wasn’t enough we then had melodrama – well TWO melodramas – the ‘end game’ of Marguerite and Armand – beautifully danced by the wonderful spectacular diva that is Zenaida Yanowsky as she takes her final bow – and the fabulous departure of this magnificent ballerina as we watched the stage fill with floral tributes – all in her favourite flowers – and Carlos Acosta make a spectacular entrance that brought the tears streaming down Zenaida’s eyes like a fountain gushing forth joy – and a cinema filled with sobbing – and not a dry eye in the house! Watched Zen's and Alex (Ferri)'s shows: gorgeous, moving and compelling- all three ballets, not just Marguerite and Armand. Beautifully light quartet of fairies in The Dream- Harrod, Pajdak, Pitchley-Gale and Maguire really made me believe they could fly off any given moment. Zucchetti and Yudes were light on their feet, lightning fast and funny as Puck. Just sheer beauty in Symphonic Variations from both casts. Both Marguerites and Armands producing powerful performances, proving that the ballet can have a life of its own away from Margot and Rudi, and isn't just a star ballerina vehicle. Hope the cinema relay can be released as a DVD- it's been ages since Dream and Symphonic V were last recorded by the Royal Ballet (a few audience members and I browsing for souvenirs in the shop stall at the interval were a little disappointed to find that the only DVD of The Dream available was the Balanchine version by Pacific Northwest Ballet- beautiful as that performance was, it wasn't the Royal Ballet Ashton version we were looking for.) Couldn't find a DVD of Symphonic Variations at all! We had a fabulous evening at the Arts Cinema in Cambridge, though I am surprised that Miss Yanowsky did not choose A Month in the Country for her swan song; a glorious, seemless ballet with no irritating pauses. For me the stand out performances were Stephen Macrae and Valentino Zucchetti. Sharon Keogh made a good point concerning Arkane Takada's shoes. They were in terrible condition. The left shoe had a very obvious lump close to her little toe. I can only assume that her feet were causing her problems and the only way she could get through the evening was be donning a pair of well worn practice shoes. Please enlighten us. No other dancer was sporting tacky shoes. I'm always on the edge of my seat watching Symphonic Variations - there was absolutely no need to be nervous. I'm glad someone else has mentioned the condition of Akane Takada's shoes. Would love to know what the problem was. An explanation would be appreciated. I just hope not to see that again, it's quite unfortunate because no matter how good the top half of her body was I was just distracted by the shoes. I really hate scruffy/dirty pointe shoes. And it's a given that it would never happen at the POB aa their shoes are always immaculate. Had a wonderful evening at the cinema last night. It was a terrific programme from the magical and laugh out loud Dream to the heart wrenching M &A at the end. Loved every minute of it and the standout performances were too many to mention. Being part of Zenaida Yanowsky's last performance was really exciting and moving. (ROH knows how to do a send off!). Could I pay tribute to Kevin O Hare who is doing a marvellous job as Director and is always a pleasure to listen to. As always, Darcey and Ore brought unbridled enthusiasm to the evening (and some interesting background detail) and you can forgive Darcey the odd fluff because she is so charming and generous (as we left the cinema, she was wiping away tears and hollering her support for Zenaida). A fabulous evening - and now looking forward to next season's shows. PS I hope Zen will be cast and will be happy to return a guest artist for next season's Alice's Adventures in Wonderland (as Queen of Hearts) and in the Obsidian Tear mixed bill (as Marguerite). I note the casting for those parts haven't been announced yet. It would make those shows even more amazing. Fingers crossed! A great evening last Monday. My favourite was The Dream. What beautiful dancing from Laura Morera and Alexander Campbell. Two outstanding dancers who really dance the music – not just the steps – rare indeed! Great acting too from Campbell – so moving. A delightful Puck from Luca Acri. Yuhui Choe was as radiant as ever in Symphonic Variations. James Hay and Tristan Dyer were lovely but it was a pity Vadim Muntagirov’s epaulement collapsed occasionally. Loved Marguerite and Armand especially Vladimir Shklyarov racing across the stage to see Marguerite. He’s such an elegant dancer and conveyed the emotion you’d expect from Armand. After seeing the live relay in Dorchester on Wednesday, we were in London yesterday to see it all 'for real' at the ROH. This was the casting of my choice as I particularly wanted to see Lauren Cuthbertson in Symphonic Variations and her performance was a dream - well worth the trip! 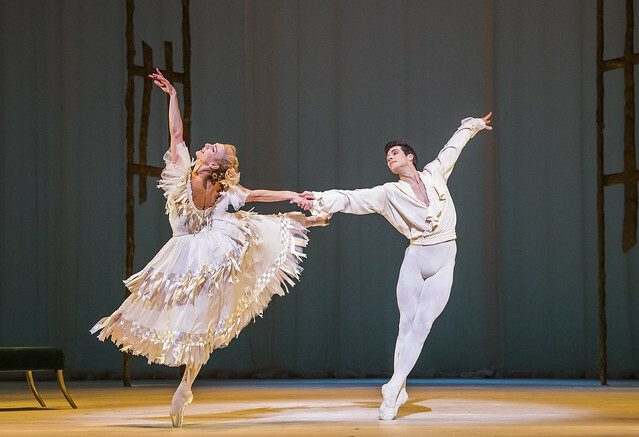 I also enjoyed Francesca Hayward and Marcelino Sambe in The Dream, they are an exciting partnership and Marguerite and Armand is always dramatic. It was a pleasure to see these ballets as Ashton intended, all the action on stage and not selected bits and half body close ups. Plus the atmosphere in the auditorium and being able to applaud. The cinema is an enjoyable stopgap between the few occasions we can make it to London. Another plea for a dvd -- screening is not being shown anywhere near my location and I would love to the performance! It may be that your wish has been granted, Carolyn, (The Dream). Its listed for pre-release order from Amazon for a July release. However, Amazon have been wrong before, so we will await RB conformation. We went back to see the last show of the RB season, with Morera, Campbell and Acri as Titania, Oberon and Puck, Cuthbertson, Clarke, Magri, Ella, Stock and Sissens in Symphonic Variations, and Osipova, Shklyarov and Saunders as Marguerite, Armand and Armand's father. What a brilliant evening- Laura and Alex completely in command, with compelling acting and astonishing speed and virtuosity. Sometimes The Dream can appear to drag until the Scherzo and the final pas de deux, but they held your attention throughout. Luca in his astonishing with his jumps and turns, and made a cheeky, funny Puck. Our Symphonic Variations was a young cast of one principal among 5 talented corps and soloist performers- Cuthbertson, Clarke, Stock, Ella, Magri and Sissens, but all six danced like principals and stars giving the performance of their lives. Beautiful line and musicality, neat and elegant technique, and breathing and moving as one. One of the most gorgeous performances of this ballet I've seen over the years. Osipova and Shklyarov gave a powerful and unforgettable performance that convinced us that it was a brilliant decision to invite Vladimir - and I hope there will be more guest performances from him in future when there are long runs of M&A or any other ballet benefiting from multiple casts. What a passionate, dramatic and impetuous (both in love and in anger) Armand- Natalia normally dances in a very full on, expressive (almost expressionist) and dramatic style, while Vladimir's usual style is the more lyrical and subtle version of the Vaganova St Petersburg school, but he brought a different and more dramatic angle to it to complement his partner ...and what a secure and reliable partner he was (especially in the tricky lifts and holds) too. Saunders was brilliant and powerful as Armand's father- eloquent in every expression and gesture, even when just walking or standing. I still would like a DVD of the 7 June performance (along with 2000 other people, haha) but a small part of me wish this performance had been filmed too, as it was so special. Thank you to all the dancers, crew, coaches and staff of the Royal Ballet for a wonderful run of performances.